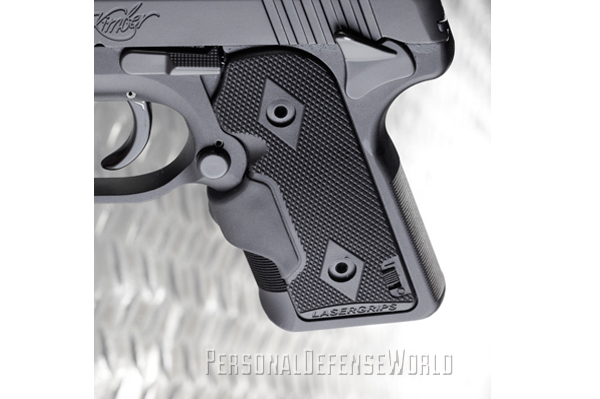 Ultra-compact companions, Kimber pistols are ready to protect in the dead of night! 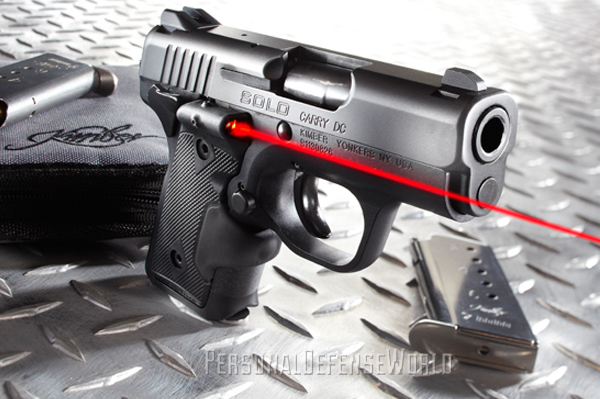 The new Kimber Solo Carry DC (Deep Cover), shown here with the optional factory-equipped Crimson Trace Laser Grip, offers users a low-profile, but highly capably 9mm carry pistol. Kimber manufactures a line of small, compact pistols to which anyone trained on the 1911 platform would have no trouble transitioning. 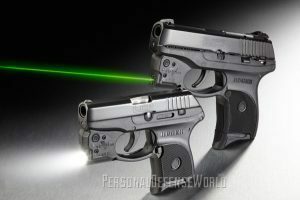 The company’s Solo series features small 9mm handguns that fit in the palm of your hand and have the power only a 9mm can give. 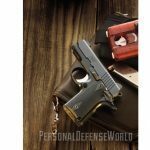 Kimber’s Micro Carry is a diminutive 1911 chambered in the mildly recoiling yet effective .380 ACP cartridge. Finally, the Ultra Carry II pistol is all-1911, down to the caliber. Chambered in .45 ACP, the Ultra Carry II is a serious fight-stopper that packs a big bullet in a little package. 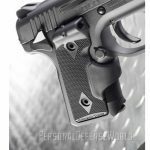 The Kimber Solo Carry DC is purpose-built for deep cover, hence the DC in the name. 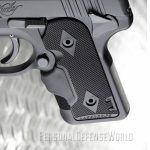 From the discrete matte black finish to the night sights, the DC is a concealed-carry gun in every sense, one that provides users with an unrivaled sense of security when in harm’s way. 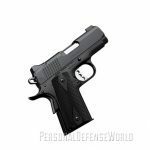 The Solo is chambered in 9mm but is the size of many .380 ACP pistols, and with a six-round magazine, it can end a conflict as quickly as it starts. 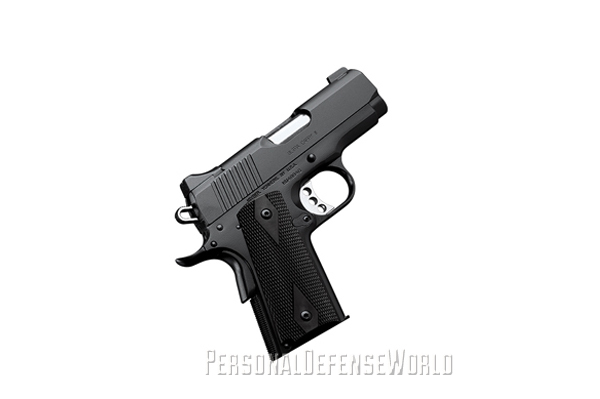 Like all Solo pistols, the Carry DC is very small and lightweight, and has features and controls similar to a full-sized 1911’s. 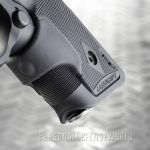 The thumb safety and magazine release, both ambidextrous, and the slide stop are all dead ringers for those on a 1911. On the inside, too, the Solo’s slide and barrel lock up in a manner similar to those inside a 1911. Where the 1911 and Solo designs diverge is in the Solo’s trigger and firing mechanism. A 1911 is single action, and the Solo uses a double-action-type trigger, but with a striker-fired, firing-pin setup. The factory sets the trigger pull at about 7 pounds. 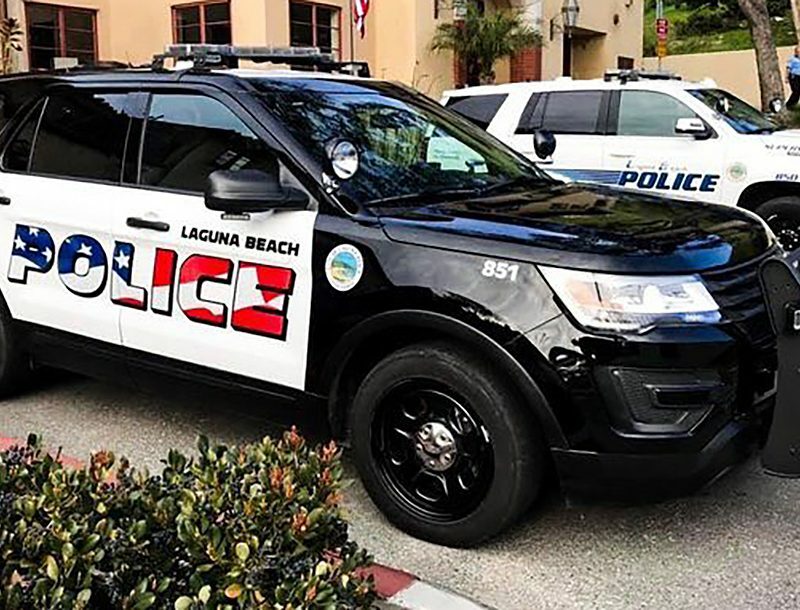 It is a long trigger pull—something advisable when your heart rate is jacked and you may not have the most precise trigger control—but it breaks crisply. While the norm these days is to produce a compact pistol with a polymer frame, Kimber engineers decided to use lightweight 7075-T7 aluminum. It is tough and light. Though this may seem like an old-school design decision, it makes sense for the Solo. There are some shooters who just prefer pistols with metal frames, and if you think the metal frame is heavy, think again. The Solo weighs a mere 17 ounces with an empty magazine. Unlike some of the other Solo models, the DC has textured front and rear grip straps for better hand control if your palms are sweaty. The Solo features an external extractor to smartly extract empty cases. It also has a loaded-chamber indicator port. A hole at the top of the breech allows the user to look into the chamber to see whether a live round or an empty case is in the chamber. Kimber is known for its “carry melt” treatment, which consists of dehorning and rounding the sharp edges of pistols. So treated, the Solo is virtually snag free. The DLC finish is tough, too, and should last until just this side of forever. According to the manual, the Solo requires a proper break-in, and Kimber recommends firing at least 24 rounds of 124-grain or heavier bullets. 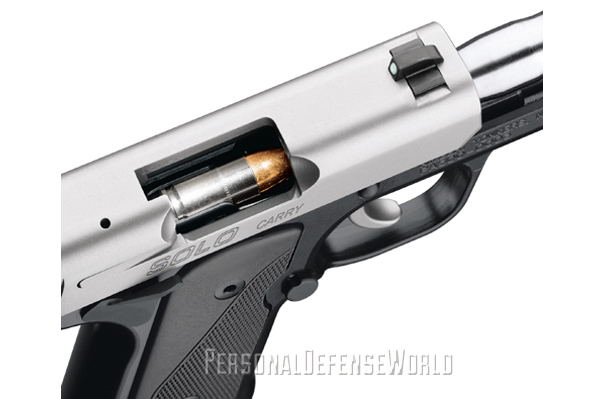 The Solo was designed to function best using hollow-point ammunition with bullet weights of 124 to 147 grains. The factory recommends Federal Hydra-Shok JHP, Remington Golden Saber HPJ and Hornady TAP JHP ammo. While other ammunition makes may perform well, the factory states that the lighter bullets and inconsistent pressures found in lower-quality ammunition may lead to decreased slide-cycle time, compromising function. It is recommended that the Solo be cleaned every 500 rounds or after each shooting session. An available extended, eight-round magazine fits all Solo models. 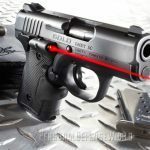 The DC (LG) model is equipped at the factory with Crimson Trace Lasergrips. 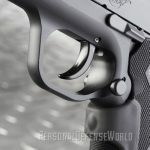 These Lasergrips are popular with shooters, as they blend and work nicely with the ergonomics of the pistol, and the laser allows a shooter to accurately aim the pistol without aligning the iron sights. The 1911 is a renowned pistol design, and the Micro Carry is a 1911—albeit one that’s been shrunk significantly. 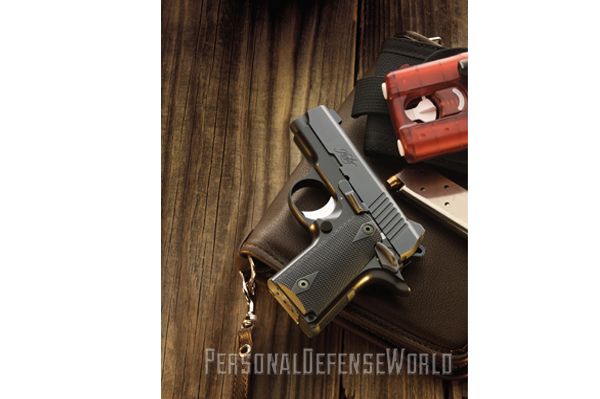 The Micro Carry is well suited to those trained and familiar with the operation of the 1911-style pistol. 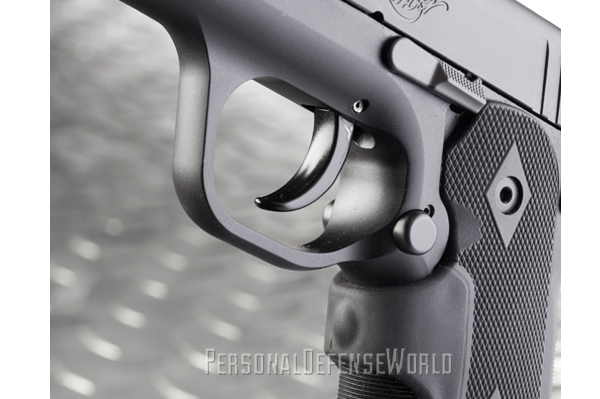 If the shooter is sensitive to the level of recoil sometimes produced by compact 9mm pistols, the Micro Carry is a solution. 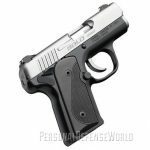 Chambered in the mildly recoiling .380 ACP, the Micro Carry offers 6+1 ammunition capacity in a 13.4-ounce package. The rear frame strap is textured to aid control in rapid fire and to provide for a firm grip. The Micro Carry is constructed with an aluminum frame. The rear of the triggerguard is cut high, causing the pistol to sit slightly lower in your hand for less muzzle flip. A mini beavertail is machined into the frame to prevent hammer bite. Featuring a 2.75-inch barrel, its overall length is slightly over 5.5 inches. Like other Kimbers, the Micro Carry has gone through the “carry melt” treatment to round off all the sharp edges. The ejection port is lowered and flared to aid in the ejection of empties. It has a matte black finish that will not reflect light. 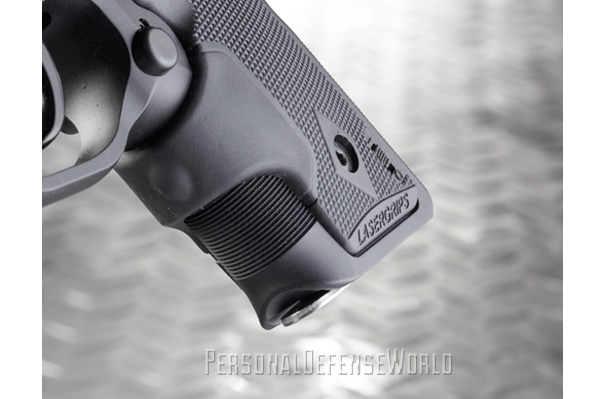 The sights are very user friendly—large without being a hindrance to deep concealed carry. They are low profile and dovetailed into the slide, so if necessary the windage can be adjusted. 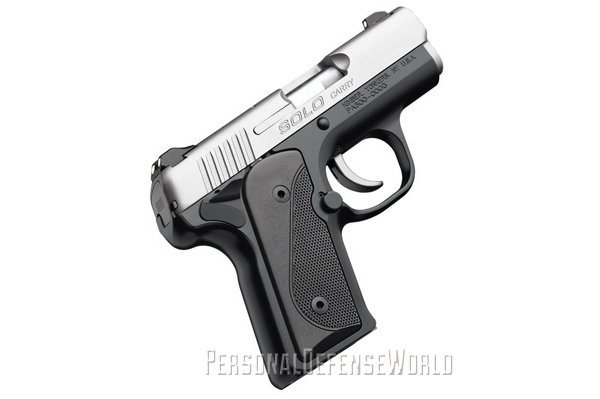 The Micro Carry is a single-action pistol with a smooth trigger pull that breaks on average at 7 pounds. The thumb safety and magazine release work just like they do on a full-size 1911.
total in 9mm and .45 ACP, but take note of the Ultra Carry II. The barrel is shortened to 3 inches, and the grip frame is aluminum. A full-size, extended beavertail and checkered rear grip strap fill your hand. 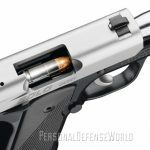 The abbreviated bull barrel does not use a bushing like a full-size 1911; rather, it’s belled out at the muzzle and fitted to the inside of the slide. The barrel is match-grade quality for added accuracy. 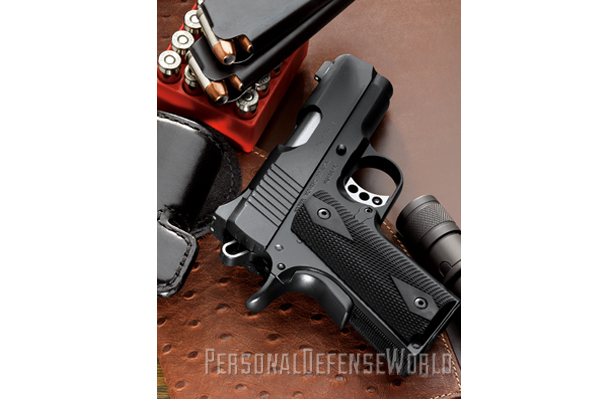 Those accustomed to 1911s will be right at home with the Ultra Carry II. The Ultra Carry II sports a matte black finish that means business. Like full-size 1911s, the Ultra Carry II is a natural pointer. 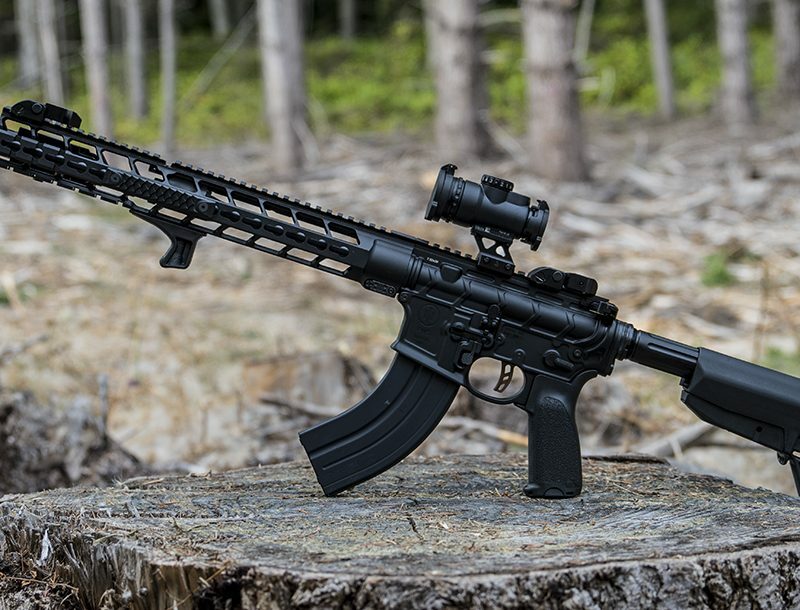 In the hand, the Ultra Carry II feels a bit heavy at the muzzle, and that is a good thing, as the added weight helps reduce recoil and muzzle flip, allowing you to get back on target fast. With a capacity of 7+1 rounds, the Ultra Carry II can end a fight swiftly when used properly. 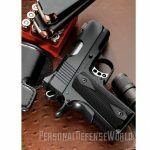 For a pistol with all the characteristics of a government-size 1911, the Ultra Carry II is thin, trim and easily concealable in a pocket or a small holster. Though slightly heavier than the Solo Carry DC or the Micro Carry, the real difference is the caliber. 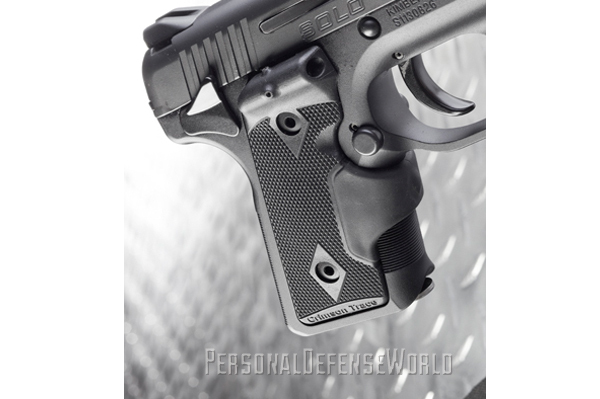 The .45 ACP is a pistol caliber U.S. Special Forces use to this day. Industry-leading pocket defenders, deep-cover Rugers combine serious firepower with superb fit and feel!